Beyonce Knowles is the latest songstress to popularize the blues standard, "At Last." After hearing the song 10 times during last night's inauguration coverage, we hope she's the last one for a while. 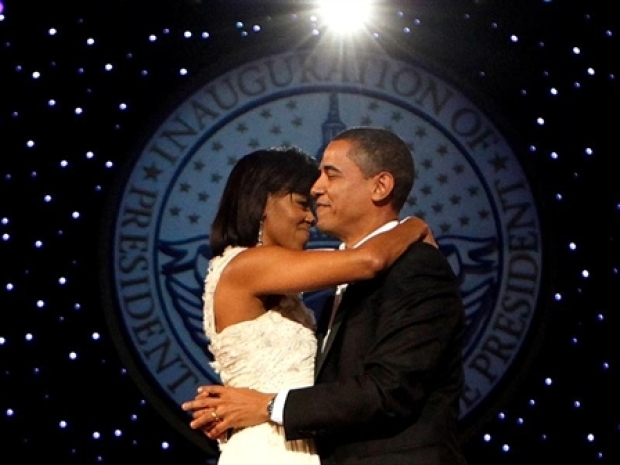 The First Couple had 10 First Dances at 10 Inaugural Balls on Tuesday night. And it's a safe bet that many Americans are humming the same tune this morning, thanks to their monotonous two-stepping. Every strut, toe tap and cheek nuzzle came to the tune of ... you guessed it: At Last! Since we've got that song stuck in our heads, we figured we'd share some interesting facts about the blues standard, and then put it to bed. Immediately. Though Etta James is the person most associated with the song, she is not the owner. In fact, the tune was a hit 19 years before she ever crooned a bar. The song was written by Mack Gordon and Harry Warren. Glenn Miller was the first to perform it. More than 20 artists---including Nat King Cole, Christina Aguilera, Cindy Lauper and Miles Davis--- have performed the single since it was written for the 1941 film "Orchestra Wives." It seems like the Obama's danced to every single version Tuesday night. The highest the tune ever reached on the Billboard Pop charts was 47, back in 1961, with Etta James' version---the same year Obama was born. It reached No. 2 on the Black Singles Charts that same year. That category has since been renamed to the R&B and Hip Hop chart. In 1999 Etta James was inducted to the Grammy Hall Of Fame with her version of the song. A Celine Dion version of the tune made it to No. 16 on the adult contemporary charts, because Canadians always burn up the adult contemporary charts. This year the song has had a quite a resurgence. Beyonce Knowles, who sang the tune for the Obama's at the Neighborhood Ball, sings the song in "Cadillac Records" in her role as Etta James. Her 2008 version of the song hit No. 79 on the R&B/Hip Hop Charts. The song was also featured in a trailer for Wall-E, the Golden Globe winning animated feature from Pixar. There you have it at last. Now that you know a bit about the song's history, here's hoping it goes back in the vault for a while. Hopefully next time we hear it we can say "At last!" instead of, "not again." Watch video of the First Couple sharing a tender moment as Beyonce sings "At Last" during an inaugural ball.